Ti/PbO2/SnO2 electrode was prepared by thermal deposition of Sn in titanium substrate and its use as indicator electrode in potentiometric titration in aqueous solution at 298 K was studied. The E-pH curve is linear with slope of 0.0501 V/dec at 298 K which is close to the theoretical value 2.303 RT/F (0.059 V at 298 K). The standard potential of this electrode, E0, is computed as 722.9 mV with respect to saturated calomel electrode as reference electrode. 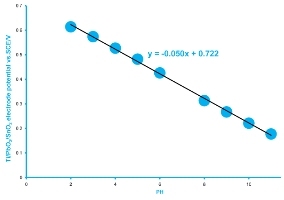 The recovery percentages for potentiometric titration are calculated. The prepared modified electrode was used in potentiometric titrations for CH3COOH against NaOH as titrant in aqueous medium at 298 K.